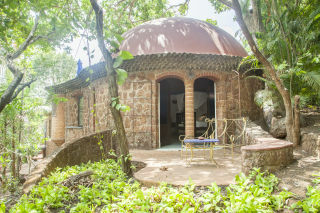 Snuggled amid dense groves of tropical foliage, this is an offering of a private room in a boutique stay, which can accommodate up to three people. 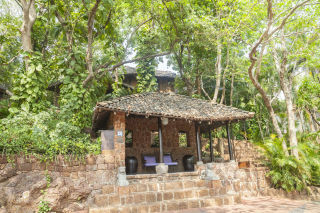 Baga Beach is located just 5.5 km away from the property, and the room on offer is ideal for luxury travellers. Generous parking area within the premises makes parking convenient for those on a road trip. 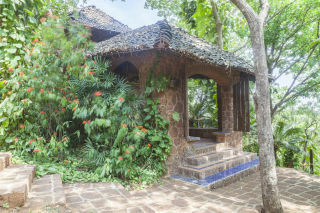 Your Space Tucked away in luxuriant tropical groves, this gorgeous hideaway is the first of its kind! Built with rustic cave-like architecture and lavish amenities, this stay boasts a sparkling blue pool that is set amidst a paved deck and a small colonnade of flagstone arches at the other end. The deck creates a luxurious dream-like ambience for a lovely poolside date. 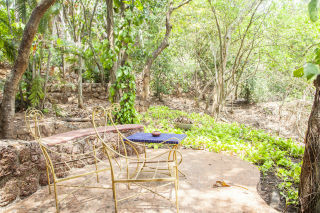 Loungers are placed here so you can unwind and soak in the stunning views with a cold beverage in hand! 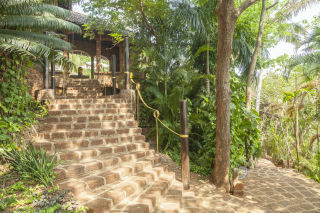 For a finer experience, you can saunter into the in-house bar for an array of drinks in the rustic beachside ambience created by its dark flagstone interiors and views of rich coconut palms. 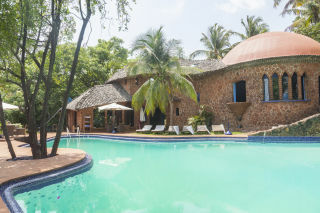 The resplendent cottage is designed with laterite stone, a mystical brick dome ceiling, terrazzo flooring and lavish interiors that have been carefully curated to provide modern comfort without disconnecting you from its natural surroundings. The sitting area boasts azure interiors and columns, coupled with plush sofas, a coffee table, potted greens, and antique earthenware. You also have access to a well-equipped gym so you never miss out on a workout, even while on holiday! 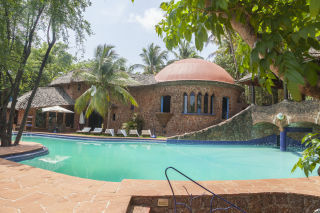 Housed in a circular flagstone structure, the room on offer features a ceiling of burnt-bricks with a sunlight spot in the centre and a canopy hanging gracefully from it. 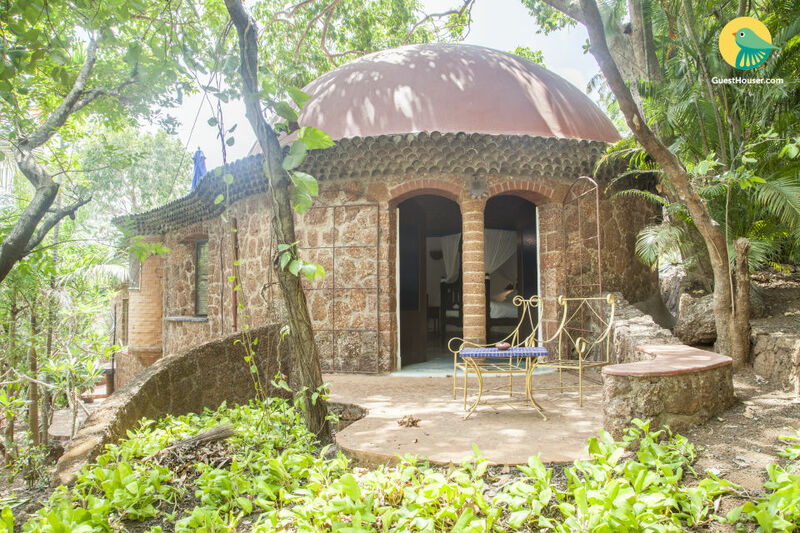 Furnished to provide modern comfort, it houses a four-poster king size double bed with a thick cushiony mattress and crisp linen, side tables, wicker coffee seating, stylish floor lamps, a writing desk, a mini-refrigerator, and a dresser. The en suite washroom is tiled and well appointed with western sanitary ware. Mapusa Bus Stand - 7.5 km.